Setting up a new pump. I use these connect water hose to a spray nozzle, wort chiller and flusher. To connect to my chiller. Dose the female connection close when disconnected? BEST ANSWER: Hello Peter - It does not. I've replaced the brass disconnects with these stainless steel ones and found them to be by far superior.. The previous ones became corroded over the years and were more and more difficult to connect and disconnect.. The stainless disconnects were a welcome change in that when connected were tight and solid,, and were effortlessly disconnected. Expensive but the sweetness of use remains long after the bitterness of cost. I had several types of connections in my brewery and finally decided to upgrade. I use these everywhere now. They are beyond handy and have saved me many hours in time lost cleaning and making switches. These are the highest grade and quality I have come across. I have friends with cheaper quick connects from other sites and they have had problems with leaks. These are super solid and leak free. A must have on your pumps. Thanks More Beer. 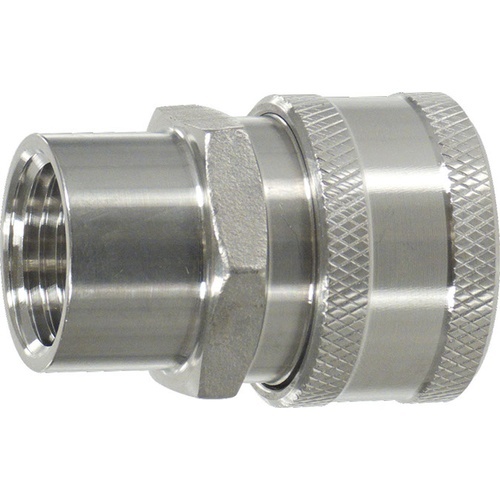 I have several of these ball lock quick disconnects to make moving hoses from one kettle to another or to the recirculation arm super easy. A bonus is the ease to clean any of these connections.